The FEDAGA potato order is due to be delivered on Wednesday 22 February (time to be confirmed ) so if you are available that day to help sort out the different allotment site orders at Inverleith Allotments and collect the order for your own allotment site ,then your help would be very welcome. Potatoes should be chitted as soon as possible by standing the tubers with the end with most sprouts uppermost – old egg cartons are ideal for this. The should be kept in a dry ,frost-free place with plenty of light. Now is a good time to get an early start with some vegetables such as chillies, tomatoes, and sweet peppers .These need a minimum temperature of at least 18 degrees to germinate. The use of a heated propagator is the best method but if you don't have one of these then you can start the plants off on a well lit window ledge in a room which is kept above 18 degrees until the seeds have germinated. The most common reason for the failure of seeds to germinate is that the temperature has not been consistent enough. Sweet peas can be started now to ensure early flowers. After germination they can be brought on in a cold frame. New rhubarb crowns can be planted now in well cultivated soil with a generous mulching of manure containing straw to deter slugs. Newly purchased strawberry plants can be potted up and brought on in a cold frame. 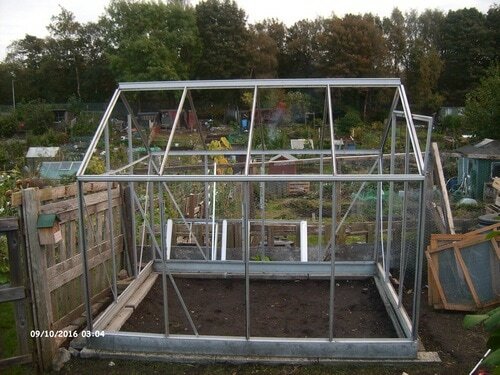 Plants surviving from last year can be covered in cloches to promote an earlier crop. Garden peas are a hardy crop and can also be brought on early. If your allotment is prone to frost, then one technique which can be used is to sow them in lengths of old plastic guttering filled with compost. I'm going to try growing Jerusalem artichokes again this year.My previous attempts have yielded poor results however I have decided that this was down to not manuring the plot adequately for the last couple of years and too much reliance on pelleted fertilizers. The gardening books say that Jerusalem artichokes are one of the easiest vegetables to grow .The tubers should be planted about 12 cm deep and 30cm apart .They have attractive bright yellow flowers and as they grow up to 2 metres tall they make a useful wind break for the back of the plot. Hardwood cuttings can be taken at this time of year.They are cuttings of mature wood from either deciduous or evergreen plants at the end of the growing season .It can take up to a year for the cuttings to develop a good root system so patience is required. The techniques is quite straightforward- cut just above a bud on your chosen plant where the current season and last years growth meet, then trim the cutting to around 20cm if taken from a larger tree or shrub and 8cm if from a smaller shrub. Remove all of the leaves and side shoots but retain buds. Then you need to make two cuts.One at 45 degrees above the top bud and a straight cut below the bottom bud. To promote rooting use a sharp knife to remove some of the wood at the base of the cutting befoe dippng in hormone rooting powder. The cuttings should then be placed in pots of compost containing a good mixture of peat and sharp sand. Place the cuttings around the edge of the pot with just the top buds visible. Space the cuttings with around 5cm between each with the top buds visible.